inside or out on the deck. On the deck is a gas BBQ for your use. horseshoe pitching for the older kiddies. their patio doors. A TV is also in each bedroom. The Living Room has a TV, DVD and VCR to enjoy. bedroom has an iron and ironing board for your use. the boat dock. 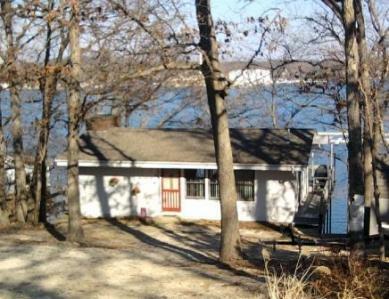 The use of the boat dock is included in your rent. Great fishing from the dock. Crappie beds have been installed. Nice swim platform or sun bathing platform. Close to golfing and shopping. For Guaranteed rate quote, please contact us. with credit card through PayPal. Children under 2 years of age are not counted. Cleaning Fee:$50 for 2 plus $5 per person over 2.